Every year for Thanksgiving we go to Fort Myers Beach, Florida. We have been doing it since I was a child. It is an extended family vacation on the beach - about 24 of us attend. The only year we have missed it is the year Eliana was born. Since then we have celebrated her 1st and 2nd birthdays on the beach. All family members are invited and all family members participate - it is fabulous to watch grown adults teenagers and older children act like young children at a 2 year old birthday party! 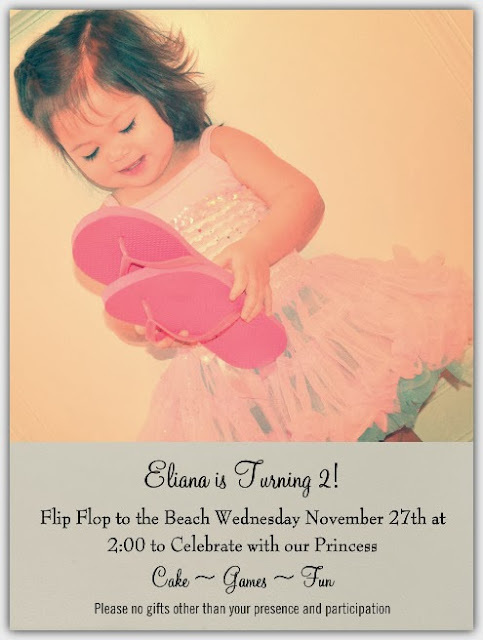 Eliana is very much into princesses and dress-up - so we combined the beach with her love of princesses for a beach birthday princess party. She wore the hat above along with her bathing suit and a tutu! All family members were split into two big groups. They then had to compete to build a sandcastle by frog JUMPING over one another around to go get sand that was placed in a bucket and then bring the sand back to their team to build the sandcastle. Notice that everyone is carrying a shovel while frog jumping to obtain their sand and carry back to their team. The actual ocean was very far from where the party was set up. For the second game everyone had to run down to the ocean, find a full shell (not broken) and bring it back. Eliana's Uncle James came in first place (above). The family members were split up into two teams again. Every participant was given a mini beach ball. They had to take turns blowing up their beach ball and throwing it into the laundry basket. Once one team member was done, the next would blow up their ball and begin trying to get it in the basket. Aunt Lauren (below) blowing up her beach ball while Eliana blew up her own ball. If you asked Eliana what she wanted for her birthday, she would always respond "CAKE!" So, she definitely got cake on her birthday. Every princess needs a castle, but when on the beach a princess needs a sandcastle! Eliana got a sandcastle cake for her birthday. She was pretty excited about it! We even served it with a sand shovel. One of her favorite foods are berries - we we had strawberry cake and vanilla cake. With strawberry ice of course, too! We are blessed to have such a wonderful family! Thanks for coming and participating in Eliana's 2nd Birthday Party!! !